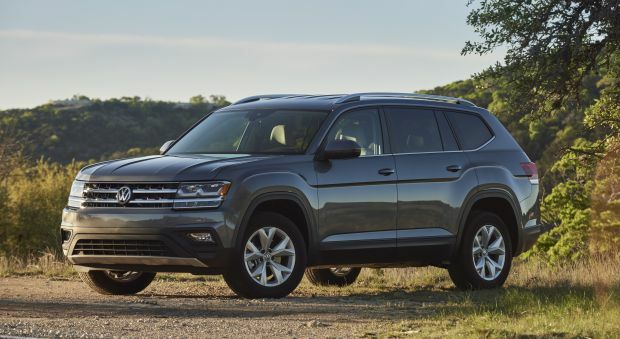 The 2018 Volkswagen Atlas is the best crossover for you if you favor smart German design over sporty German driving dynamics. Introduced for model-year ’18 as VW’s largest crossover, it’s the automaker’s first midsize-class SUV to feature three rows of seats. Designed and built in the U.S., it might not capture the fun-to-drive spirit of the brand’s Golf compact hatchback – with which it shares some underskin engineering — but Atlas does demonstrate a discipline slipping away from other Teutonic car brands: highly efficient and organized design. Its physical footprint isn’t the biggest among midsize crossovers, but the Atlas is virtually unmatched in the class for passenger comfort and cargo-hauling capability. Volkswagen is very late to the three-row, midsize crossover party, and outside of perhaps some VW faithful, Atlas is struggling for a foothold in the market. Of the 12 three-row entries in its competitive set, it ranked No. 10 in sales through the first quarter of 2018. The stigma of poor reliability and the stench of the diesel-emissions-cheating scandal continues to haunt the brand. VW aims to gain buyer confidence by covering its entire 2018 product line with the longest bumper-to-bumper warranty in the industry: 6 years or 72,000 miles. Consider the 2018 if you feel confident it’ll satisfy your need for a roomy three-row crossover. Note, however, that for model-year 2020, VW plans a shorter, five-seat variant with sportier styling, as previewed by the Cross Sport concept vehicle. As for the 2019 Atlas, expect few notable changes, although we’d urge VW to equip all trim levels with a full set of driver-assistance features, as Toyota does with its rival Highlander. 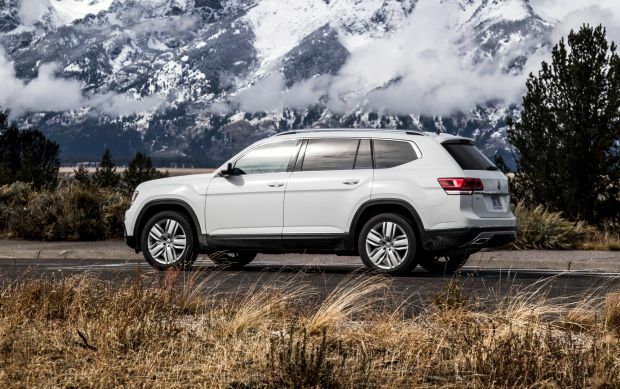 On the 2018 Atlas, items such as autonomous emergency braking, lane-departure warning with automatic steering correction, and adaptive radar cruise control were included only on the three most expensive of the five trim levels. The 2018 “launch edition” model won’t be back for 2019, but the ’19 Atlas lineup will likely reprise S, SE, SE w/Technology, SEL, and SEL Premium grades. Depending on trim-level selection, you’ll again be able to choose a turbocharged four-cylinder engine mated to front-wheel drive or a six-cylinder with front- or all-wheel drive (AWD). Styling: While it hardly takes any risks, the Atlas is handsome enough in a form-follows-function way. Highlights include a grille with a “square wave” pattern that flows nicely into the headlights and hood bulges that look a little like integrated racing stripes. Otherwise, the rest of the design is pretty conservative. The bulky, upright appearance is reminiscent of an older truck-type SUV or a 2009-2015 Honda Pilot. Seating for six or seven is available and passenger room is virtually unmatched in the class. Atlas is huge inside. A major selling point is its third-row seat, where space and comfort are best in segment. Only minivans and full-size SUVs are more commodious. The first and second rows are supremely comfortable. The seats have ample fore and aft travel, and there’s enough headroom for the tallest of occupants. Same goes for the second row. A second-row bench is standard. Captain’s chairs, which reduce capacity to six, are a $625 option on all but the S model. Cargo volume is also best-in-class, at 20.6 cubic feet behind the third row, 55.5 behind the second and 96.8 behind the first. Regrettably, a power-folding third-row seat is unavailable. Small-items storage is very good, too, highlighted by usefully sized door pockets and a wide, deep center console bin. VW thoughtfully provides USB charging points for the first two seating rows and a three-prong household-style outlet at the back of the center console that can provide up to 150 watts of power. Apple CarPlay and Google Android Auto are standard. All models but the S use an 8-inch touchscreen for audio and some climate functions. Crisp graphics and smooth operation, including support for tablet-style gestures, make it a delight to use. Exclusive to the SEL Premium is Volkswagen’s Digital Cockpit instrument panel, which replaces traditional needles and dials with a single LCD panel. It’s not quite as customizable as the similar-concept Virtual Cockpit from Volkswagen’s upscale Audi division, but it’s capable of displaying the map from the vehicle’s standard imbedded GPS navigation system. We have a few areas of concern in the cabin. The Digital Cockpit can show up to three speed readouts at once. That’s more of a quirk than an annoyance, and at least you can change the display to show something else. The only way to adjust the brightness of the instrument panel or fully turn off the climate control is through the infotainment screen, and you can’t get to these items unless the vehicle is stopped. The available lane-maintaining automatic steering correction is overly sensitive; we shut it off and steered for ourselves during our evaluation. Materials quality is fine in lower-level models. The SEL Premium, which can break $50,000, is just OK in this department. It’s the only Atlas with genuine leather upholstery, and the plastics have a nice texture. You don’t have to look far to find hard, hollow panels, however. Its woodgrain trim is a poor imitation of the Formica in your grandmother’s house, and the silver-look trim surrounding it is unconvincing painted plastic. Mechanical: Standard on the front-drive S, SE, SE w/Technology, and SEL is a variant of Volkswagen’s corporate 2.0-liter turbocharged four-cylinder engine. In the Atlas, it produces 235 horsepower and 258 pound-feet of torque. While we have not evaluated this engine, we expect it to be over-matched in a crossover that weighs more than 4,200 pounds. Optional on front-drive models and standard with AWD is VW’s unusual narrow-angle six-cylinder engine, which it calls a VR6. It’s a 3.6-liter with 276 horsepower and 266 pound-feet of torque. Output is class-competitive, though with curb weights ranging from 4,336-4,502 pounds, Atlas doesn’t have the lively acceleration of a V-6 Honda Pilot. An 8-speed automatic is the sole transmission. It’s not always quick to respond to throttle inputs, but it’s more cooperative at low speeds than other automatic-equipped VW vehicles we’ve tested recently. 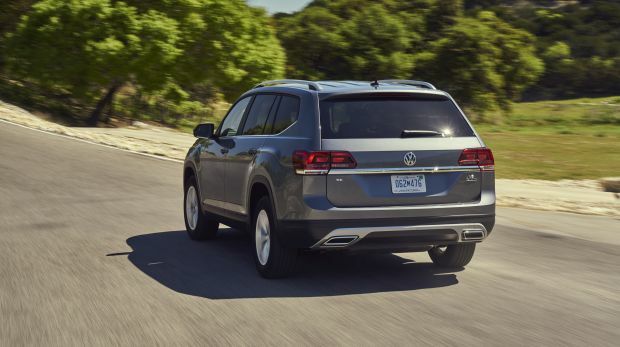 Atlas’ handling characteristics are a jolt of reality to brand loyalists who expect a crossover with Golf-like response, but in the context of three-row midsize crossovers, especially one this spacious, road manners are just fine. Steering response is good, there’s not much body lean in fast turns, and Atlas grips well enough in corners taken at sane speeds. Despite a relatively generous 8 inches of ground clearance, this is no off-roader. AWD versions, however, get a terrain selector dial that adjusts traction control, throttle, and other drivetrain settings depending on surface conditions. Ride quality is best on the standard 18-inch wheels. The 20s that are available with the V-6 engine improve dry-road grip but compromise the suspension’s ability to soak up large bumps. We’re not convinced this is an equitable tradeoff. If the Atlas you desire otherwise includes the 20s, we would ask your dealer if they can swap them for the smaller 18s. There’s no debate about Atlas being one of the quietest crossovers. The V-6 sounds refined during acceleration and fades into silence at cruising speeds. Even the larger 20-inch tires generate little ruckus on coarse pavement. Despite its tall, blocky styling, almost no wind noise enters the cabin. Features: Atlas S models have a basic set of standard equipment. Its only real standout features are LED headlights and dual-zone climate control. Most buyers should start at the SE grade, which adds niceties such as heated windshield washer nozzles, keyless access with pushbutton ignition, rain-sensing windshield wipers, automatic headlights, leatherette upholstery that does a good job of simulating the real stuff, power driver’s seat, heated front seats, rear side-window sunshades, high-resolution 8-inch infotainment screen, blind-spot alert with rear cross-traffic detection, and VW Car-Net Security & Service telematics. The SE w/Technology gains remote engine start, three-zone automatic climate control, power rear liftgate, adaptive cruise control, autonomous emergency braking, forward-collision warning, and automatic steering correction. SEL grades add a memory function for the driver’s seat, power front-passenger seat, panoramic sunroof, hands-free operation for the power liftgate, and front- and rear-obstacle detection. Included on the SEL Premium are all-wheel drive, LED taillights, power-folding exterior mirrors, ambient interior lighting, leather upholstery, ventilated front seats, heated outboard rear seats, imbedded GPS navigation, VW’s Fender-branded audio system, VW Car-Net Guide & Inform telematics, and a surround-view camera. Volkswagen had done a good job pricing Atlas competitively. Note that the starting figures we list here include the manufacturer’s $925 destination fee. With front-wheel drive and the turbocharged four-cylinder engine, the S model starts at $31,675, the SE at $34,765, the SE w/Technology at $36,865, and the SEL at $40,335. Add $1,400 for the V-6 engine and another $1,800 on top of that for AWD. The SEL Premium resides in the upper echelon of the competitive set, with a starting price of $49,665. There are only three major factory options. Second-row captain’s chairs are $625 and available on all but the S. SEL and SEL Premium models offer 20-inch black-finish wheels for $995 and $235, respectively. The $1,960 R-Line Package for the SE w/Technology and SEL includes unique exterior styling cues and wheels. At a list price of $40,065, an AWD V-6 SE w/Technology would be our pick for best value in the Atlas lineup. Atlas’s EPA ratings are near the bottom of the competitive set. With front-wheel drive, the four-cylinder model rates 22/26/24 mpg city/highway/combined and the V-6 18/25/20. The AWD V-6 rates 17/23/19 mpg. Our AWD SEL Premium averaged just 18.7 mpg in our suburban test loop. All models use regular-grade 87-octane fuel. As this is a brand-new vehicle, don’t expect much in the way of significant changes for the next several model years. We would like to see VW follow Toyota’s lead and make driver-assistance features standard across the board. It will also remain to be seen how Atlas stacks up in terms of reliability. The 6-year/72,000-mile warranty is a nice value-add, though it probably won’t mean a lot if the vehicle must make frequent trips to the dealer.